Globe-trotting dual Group 1 winner Star Witness has arrived safely at Widden Stud and will be in sparkling order for inspection at the Widden Stud open days. 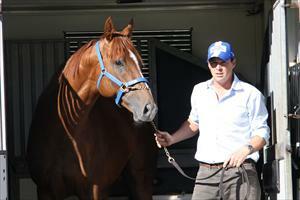 "Star Witness arrived on Wednesday and has settled in nicely,” Widden Stud owner, Antony Thompson said. MISS ANDRETTI – Australian Horse of the Year, Champion sprinter, 19 wins and $2.5 million. CULMINATE – Group I winner, just retired. BELLA INEZ – Dam of Blue Diamond runner up HALLOWELL BELLE. DANE JULIA – Group I winner, just retired. DEFRERE'S VENTURE(USA)– Multiple stakes winner in the USA. DANESTY – Stakes performing Danehill mare, full to a Group I winner.